KIEV, February 6. /TASS/. After former Ukrainian President Viktor Yanukovich had been found guilty of high treason, the Ukrainian Prosecutor General’s Office requested that Interpol issue a red notice arrest warrant for him but the request was denied, Prosecutor General’s Spokesperson Larisa Sargan told the Ukrainian News Agency. "We request an arrest warrant but they refuse. They consider it to be political persecution," she said. 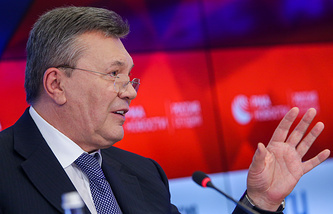 Earlier on Wednesday, Yanukovich said at a press conference in Moscow that he was not on the Interpol wanted list and his movement was not restricted. "I can freely travel across Russia, I am not on the Interpol wanted list. I can travel to any country," he said.